Apple has done it again. 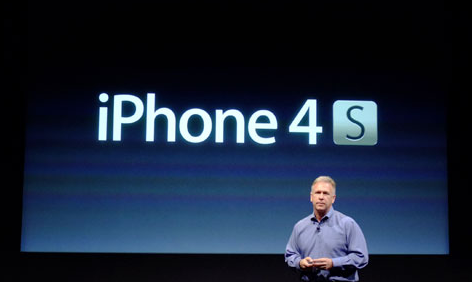 Most people anticipated the iPhone 5 being introduced today, but instead we got the iPhone 4S. Physically, there are no changes, it looks the exact same. No bigger screen, no holographic display or laser keyboard? What’s the hype? Well, the iPhone 4S still has a lot to offer. Photo editing available, 8 mp camera, dual core A5 chip (like the iPad 2), but that’s just the beginning. The biggest news that the new CEO, Tim Cook announced today is Siri: the voice assistant. It is described as, “an intelligent assistant that helps you get things done, just by asking.” Sounds kind of weird, huh? But this new feature will allow you to search something in Google, transcribe text messages, set your alarm, schedule appointments in you calendar, plus more–all by talking into your phone. Apple is working with Yelp as well. While demonstrating Siri, Scott Forstall, Apple’s iOS chief asked, “find me a great Greek restaurant in Palo Alto.” The phone says: “I’ve located 14 Greek restaurants. Five are in Palo Alto. I’ve sorted them by rating.” Seems pretty convient. Right now Siri is in beta, but will eventually be available to everyone in English, French and German. With the Android already supporting several voice-recognition features will this make this type of technology more mainstream? Another big announcement includes new apps called Find my Friends, Reminders and Cards. Find my Friends is similar to Google’s Latitude, but Apple designed it to use with circles of friends and family. There are privacy settings so that you don’t have to worry about people knowing where you are at all times. This app seems ideal for parents who are wanting to keep track of their kids, but we can only imagine how much kids are going to hate it. In addition to AT&T and Verizon carrying the iPhone, Sprint will now be added to the picture. Sprint may have an upper hand though, the $199 for 16 GB, $299 for 32 GB, and $399 for 64 GB also includes the data plan. That’s right, there will be no extra charges per month for data with Sprint. Pre orders for the 4S start October 7, and will be available in stores on the 14th. 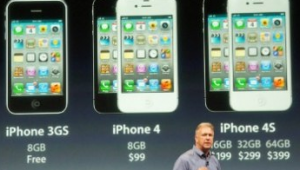 Are you impressed with the new features or disappointed that was no introduction of the iPhone 5?